This rounded chaise might be tricky in a standard room, but it works perfectly in this odd corner near the staircase. When choosing furniture to fit an angled corner, like this one, don’t be afraid to pick pieces with a unique shape or scale. 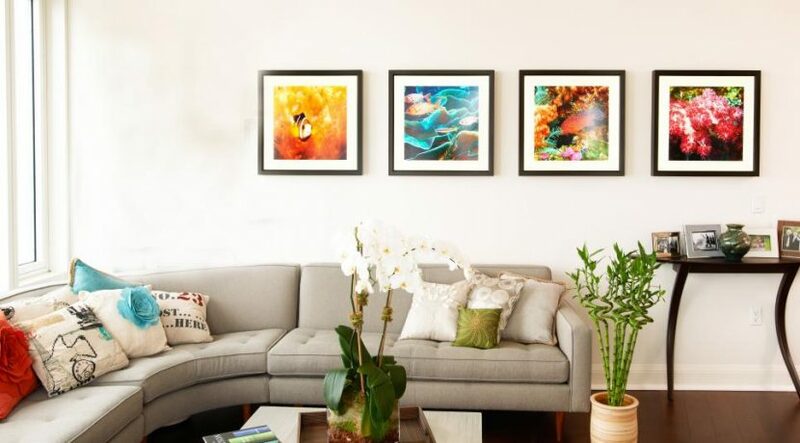 Extending a gallery wall into a corner helps the lines of your space disappear. Choose artwork of varying sizes, shapes and textures for bigger impact. This is also a great trick to use in a smaller space, to make it feel a bit larger. If you have an odd corner in your home and you’re not sure what to do with it, consider creating an extra cozy seating area like this one from designer Kari Whitman. All you need is 1 or 2 chairs and a small side table. This can work really well in an extra long living room, family room or even in a master bedroom. This clever desk makes use of an otherwise abandoned corner in a NYC apartment. A solution like this one from Design Development might require some additional custom work; however, it’s worth it to add the functionality of a desk to your space. Here’s a chic corner from Blackband Design that makes great use of the space with the addition of a window seat. You can either create a custom solution or use a pre-fab model, but whichever you choose, work in some hidden storage with a lifting lid or cabinet-style doors. This adorable black-and-white playroom from Chango & Co. makes use of the corner by suspending storage baskets from the ceiling at varying heights. The trick brings the eyes up and helps to make the space look larger, while keeping toys and clutter off the floor. If you need some extra storage space, you can use a corner to add additional shelving. You can also use your corner shelves to create a focal point, or use them to display some cool objects, photos or books.